Hyderabad, Nov 23 (IANS) United Progressive Alliance (UPA) chairperson Sonia Gandhi on Friday said the Congress carved out Telangana state, though it had to pay a political price for it. On first visit to Telangana after it came into being as a separate state in 2014, the former Congress president said it accorded statehood though it had to pay a price for this. "You know if a newborn is not properly taken care of in the initial years, he has to face many problems in future. Unfortunately, the responsibility of looking after the child was entrusted to those who only looked after themselves and left the child to fend for itself," said Sonia Gandhi. Stating that elections are an opportunity for people to get rid of this difficult situation, she appealed to people to use the power of vote to teach TRS a lesson and bring Congress and its allies to power with a huge majority. 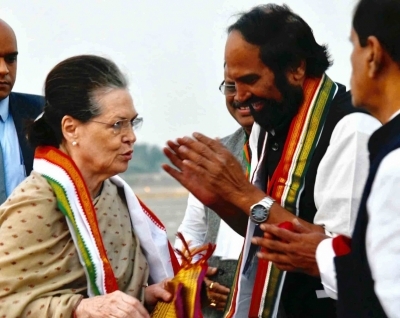 Leaders of Telugu Desam Party (TDP), Telangana Jana Samithi (TJS) and Communist Party of India (CPI) shared the dais with Sonia Gandhi and Congress president Rahul Gandhi. Former Maoist ideologue and revolutionary balladeer Gaddar, Madiga Reservation Porata Samithi (MRPS) leader Manda Krishna Madiga and leaders of various other groups felicitated Sonia Gandhi.